On the weekend we purchased our first homeschooling curriculum for our children: a Pre-K program in English. If it looks good, then we will try out the Kindergarten program as well. It feels like something real has taken place; a movement of sorts, from just thinking, dreaming, envisioning, to actually taking a step. What is it about actually paying for something intended for a specific purpose that makes it feel so real to me? Our next step will be finding items that can work as a complementary curriculum in German while we are on vacation in Germany. As many of you probably know, homeschooling in Germany is illegal. Although the curricula we are purchasing and putting together are for my children, they could care less whether they have a curriculum or not. They don't care whether the items we have are new or used, are loaned from the library for a few weeks or are actually owned by us. They are in their own world of immediacy and items like books are simply to be read, toys to be played with, regardless of where they came from. So, the question is: for whom is the curriculum? Is it for my children or is it for me? Does it take purchasing a curriculum to make me feel like a "real" homeschooling mom? Aren't the hours spent sitting on the sofa reading books, building structures, adding and subtracting items for the fun of it, practicing writing while creating a birthday card all considered homeschooling as well? Ultimately, what is the difference between homeschooling and doing interesting things at home? I am really not sure but I have some kind of faith that makes me believe we will figure it all out as we go along. At this point we still have room to make mistakes, try out different methods and curricula and to find our way toward what it really means to homeschool. 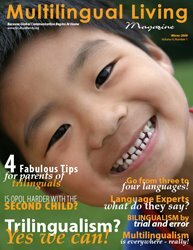 When we decided to raise our children bilingually, there was a period of time when we went through the steps of making a conscious decision; going from just raising our children bilingually in some kind of natural, haphazard way to coming up with a kind of plan, thinking about a process with desired outcomes and possible pitfalls and then taking that first, small, tentative step followed by a steady, comfortable gait. Once we took that first step, we became a new family in many ways. We didn't necessarily DO things differently but we felt different about what we were doing and we felt that we were starting along a path that although would demand continual deciphering skills, would nevertheless contain mileposts, roadmarkers and a general flow of direction (albeit, a direction, mileposts and roadmarkers of our own making to a great degree). We went from saying we were intending on raising our children bilingually to saying, "Yes, we are raising our children bilingually in English and German." Before we took that first conscious step we just weren't sure what kind of answer to give. Will we regret the decision to homeschool our children bilingually? I have absolutely no idea since we haven't really even started but all I can say right now is that it just feels right to all of us and we are waiting in anticipation for that package to appear on the porch any day now. In the meantime, our oldest child continues to request that he "do homeschooling" which means working in a math workbook that we purchased recently at our local math and science store. I go over the pages in his math workbook with him in English and my husband goes over them in German. Which, as all new choices do, brings up a new set of questions: will I be confusing my children if I homeschool them in English even though we all speak German at home? Will it all work out if we do the work in English and then when we are just sitting back chatting it is all in German? There is something inside my head that is telling me, "Yes, it will be just fine," but of course there is another part that says, "Hmmm, how can you be so sure?"